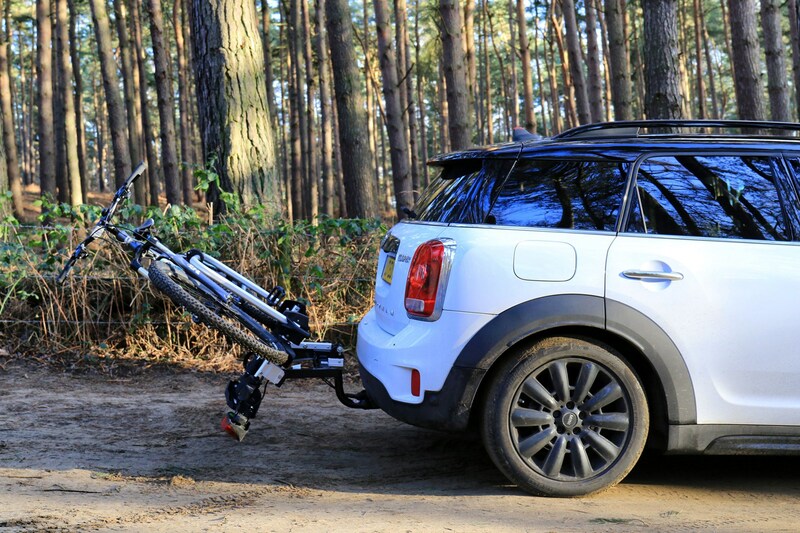 Should you go for a roof-mounted rack or towbar-mounted? 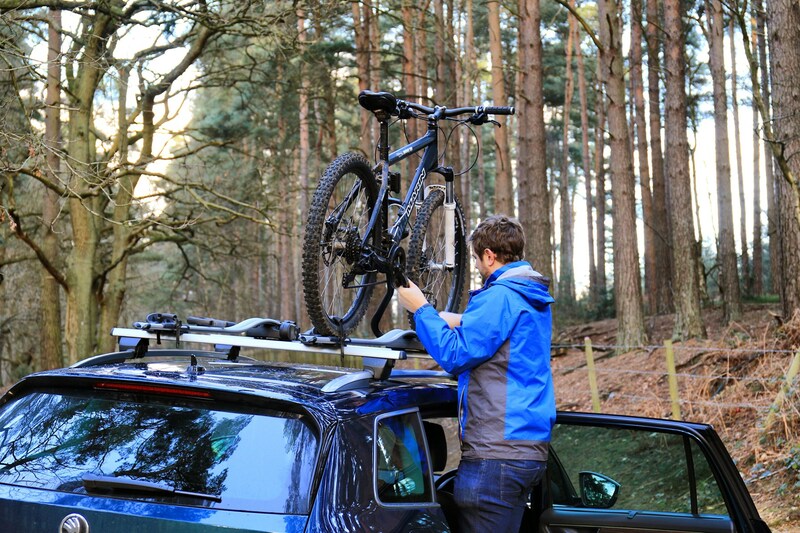 Picking the right bike rack for your car is an important decision. Not only is it a big financial outlay, but the ease of use needs to be just as high on your list of priorities. 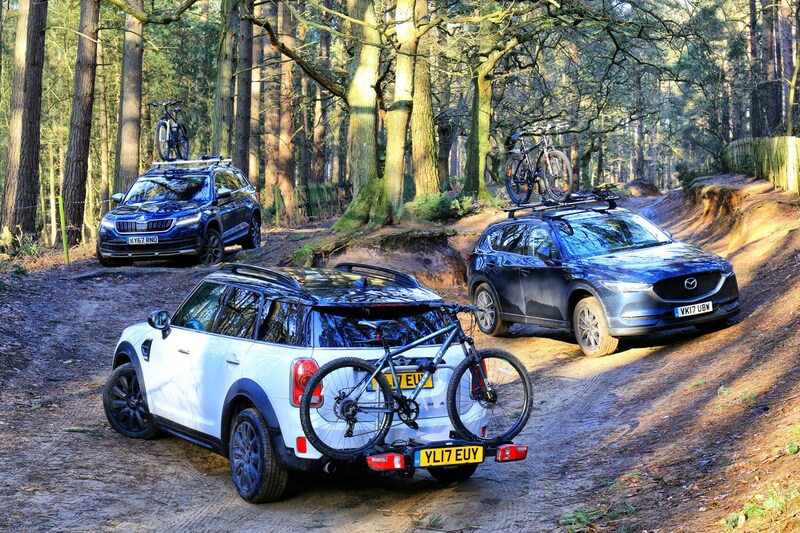 What you don’t want is to find yourself somewhere ill-equipped or unable to make full use of the bike rack you’ve opted for, so we’ve put a couple of different types to the test on three of our long-term test cars - the Skoda Kodiaq, Mazda CX-5 and MINI Countryman. 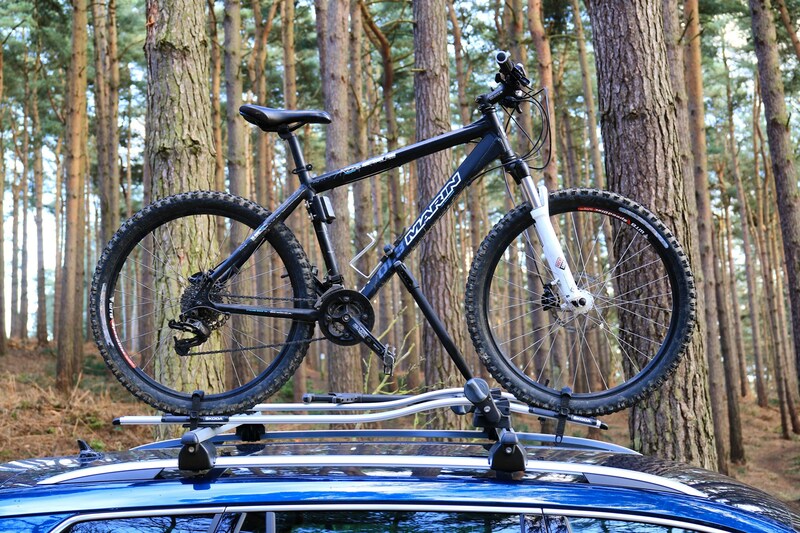 Fitted to both the Skoda and Mazda are a pair of bike racks using roof bars. 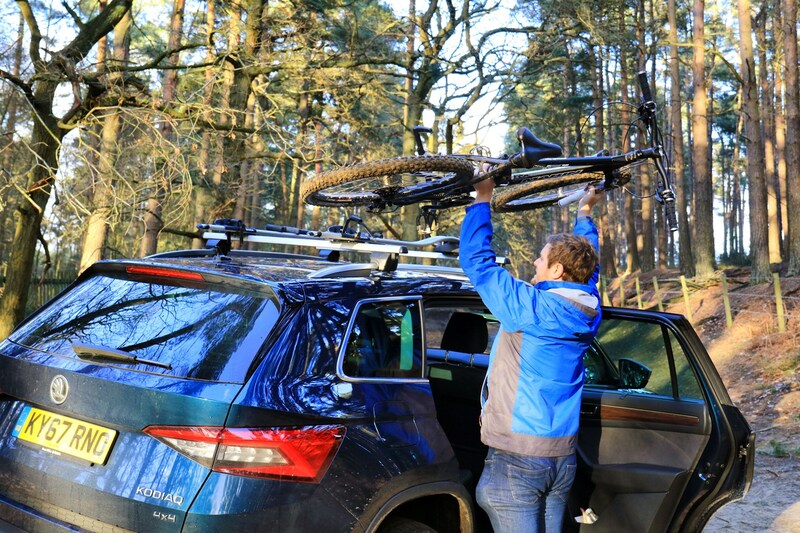 The Skoda has roof rails running from front to back so it’s easy to attach some crossbars that a bike rack can attach to. 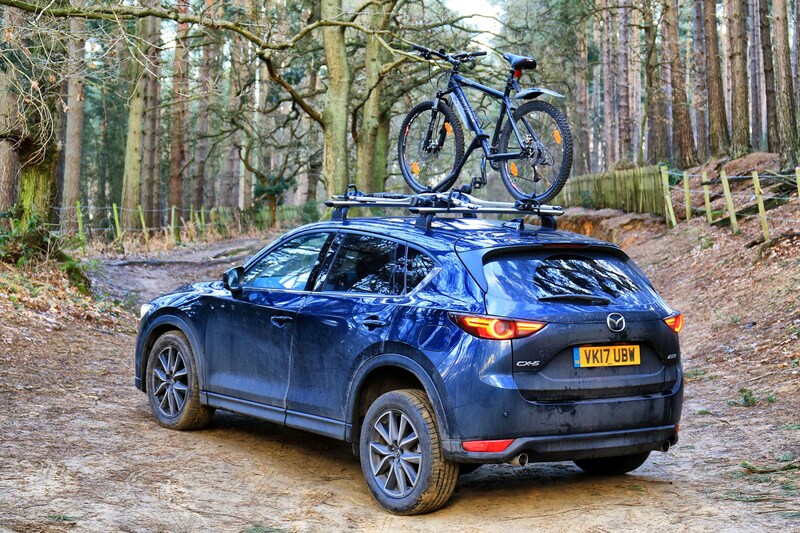 The CX-5, however, doesn’t have rails so the crossbars must fit straight into a pair of fixings on the roof. It’s a bit more of a faff, and not as quick and easy to fit as the Skoda’s crossbars, but once they’re in place the Thule bike fixings are very simple to install. Having roofbars fitted to a few of the Parkers long-termers has shown up that there's a real mixed bag of clamping methods and levels of ease of installation. 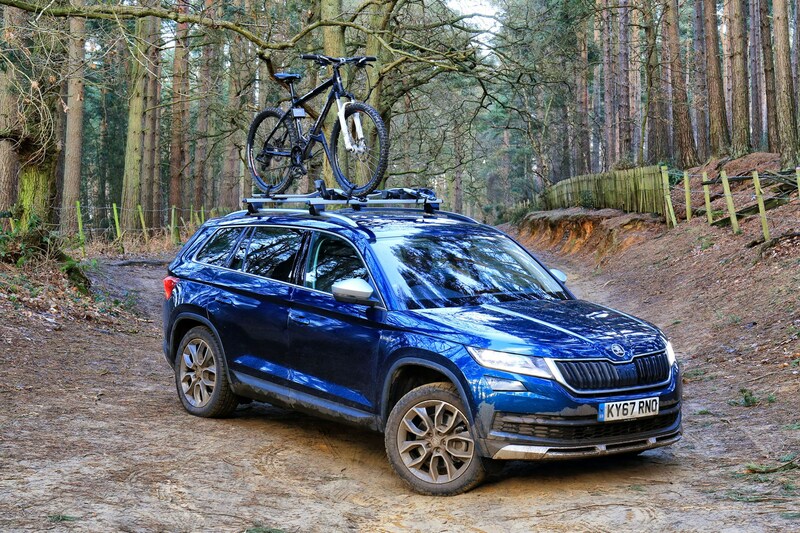 The Kodiaq’s bars are among the best we’ve used because they only really fit in one location. There aren’t any markings, like in the Audi A4 Avant we ran for a while, but they’re shaped to lock to just one place on the roof, so you can’t really get it wrong. That means there’s no need to get a tape measure out and ensure they’re exactly 120mm from the mid-point of the B-pillar or some such, like we had to do with our Volkswagen Touran. Once located it’s an easy job of clipping the base together and then clamping it down with an integrated lever – no screwdrivers or spanners here (except for the person installing it). 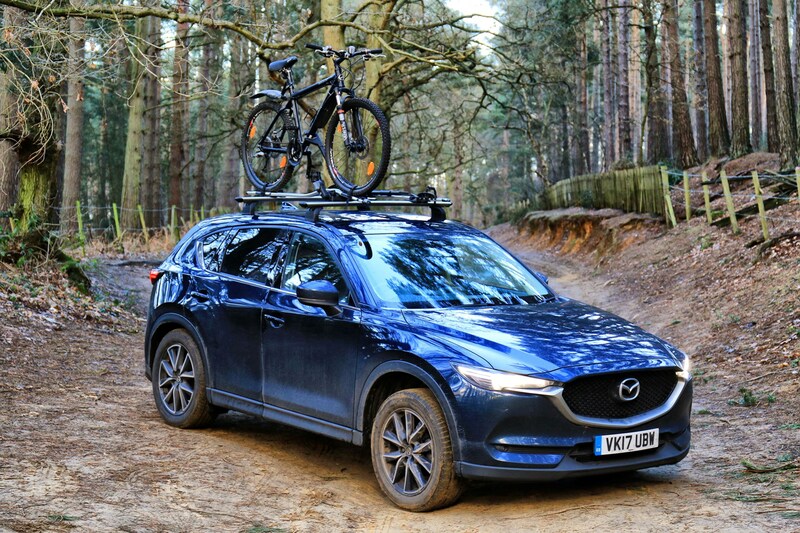 Lockable covers then slide over the feet for security, while the Thule bike rack attaches in the same way it does on the Mazda CX-5. 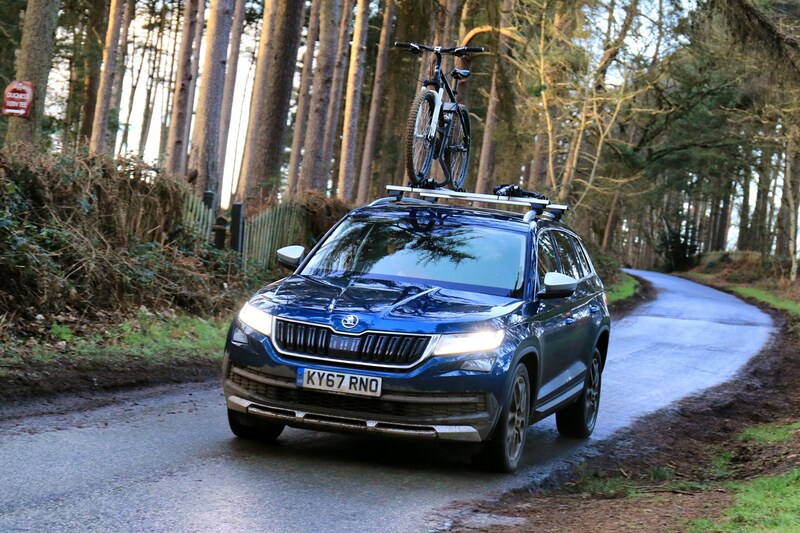 On the move, the Kodiaq's roof rack is so quiet we lazily just left it on all the time – there’s barely a whisper of wind, unlike the Mazda’s noisy bars. Anecdotally, we found the fuel economy dropped by about 4mpg, however. 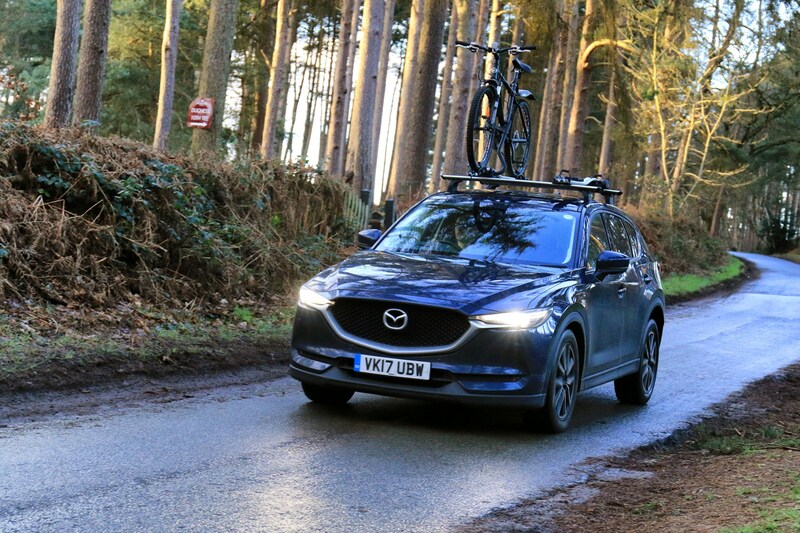 With a bike installed it’s a bit noisier – this time on a par with the CX-5 – but it feels safe and secure with no worries of it falling off. The Skoda bars are Simply Clever – no surprises here. While the Skoda's roof rack fits straight to the car, the Mazda's requires some extra scaffolding, since roof rails aren't standard on our model. We got Mazda to fit ours in update 10 of our long term test, which you can read about here. As a result, we noticed a significant increase in wind noise in the transition from bare-roofed CX-5 to having both rails and mounting points fitted - the Kodiaq is quieter by far. The resulting hurricane of noise is loud enough to encourage you to remove the entire construction as soon as you get home from a cycling trip - practically everyone who drove the CX-5 with bike rack in place complained about the din it created, with it even whipping up an irritating breeze from speeds as low as 40mph. The additional volume also explains another downside of the CX-5's roof rack, a fall in fuel economy, courtesy of the added wind resistance. 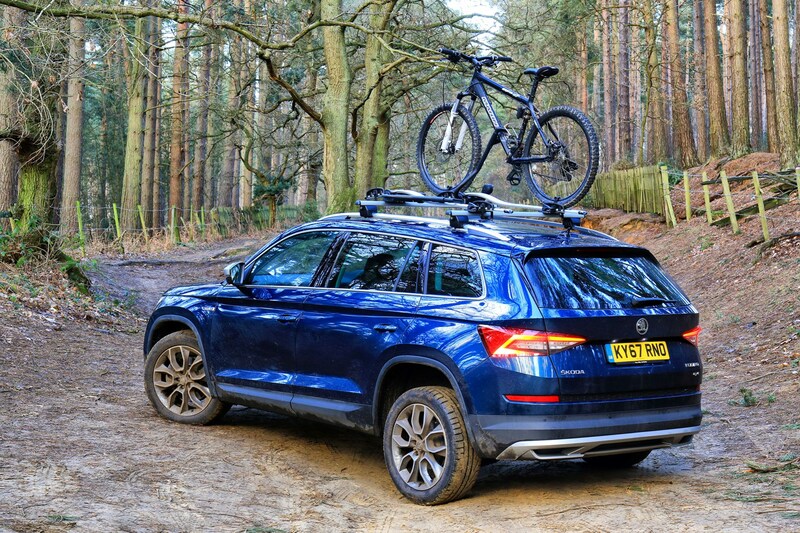 As with the Kodiaq, this roof rack could cause you to spend much more on fuel; the first two tanks once the bike rack was fitted came in around 7mpg lower than the previous two. 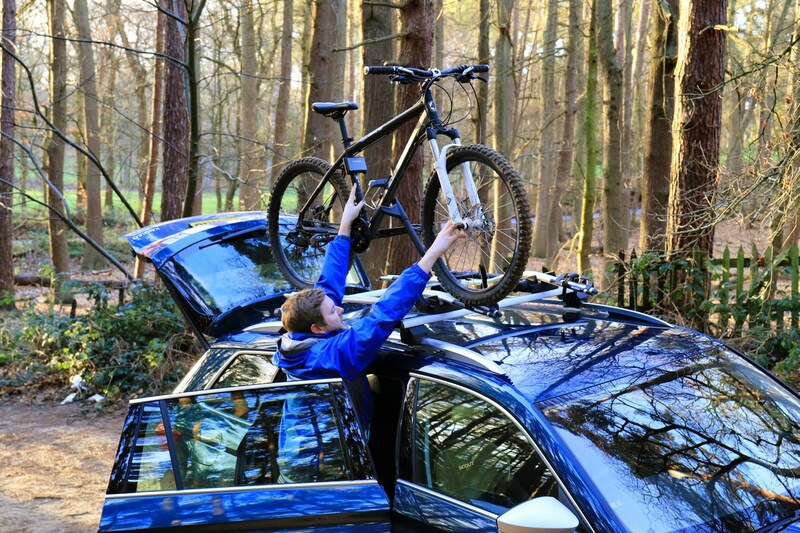 A more fundamental issue for most drivers - and cyclists - is whether they'd actually be able to load and unload bikes from the CX-5's roof. 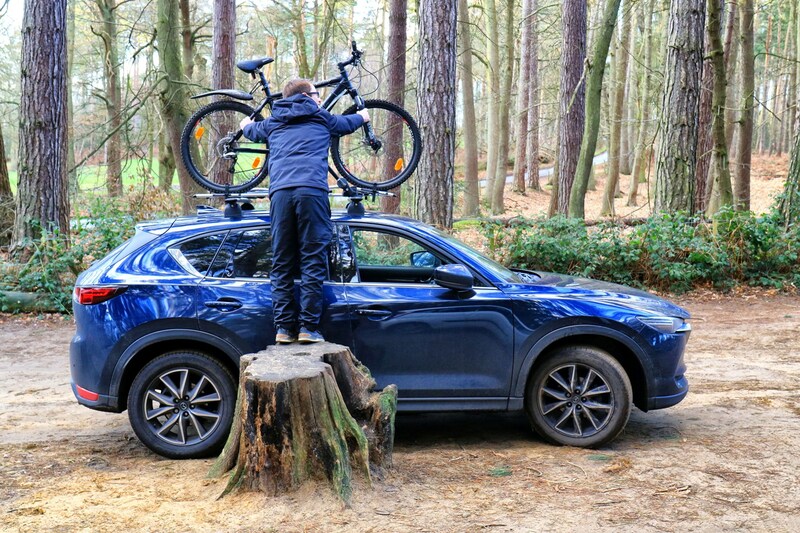 Even with the assistance of a two-and-a-half-foot tree stump to stand on, we still didn't find it easy to load bikes onto the top of the Mazda. 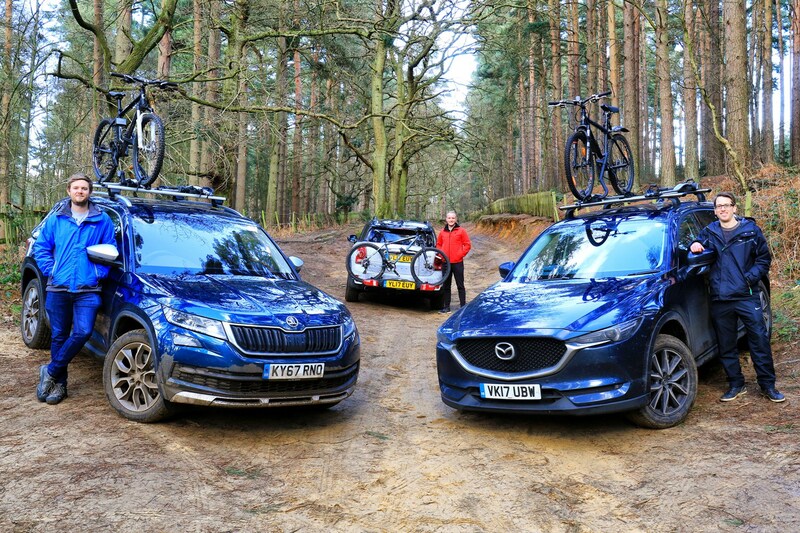 Aside from being 20cm taller than the bigger-booted Mazda 6 Tourer estate, it's also a tiny bit taller than the Kodiaq, with the need for taller mounting points than the Skoda (due to the lack of roof rails) only making it more difficult to load bikes. For even more insight into this, check our update 12 of our long-term test. 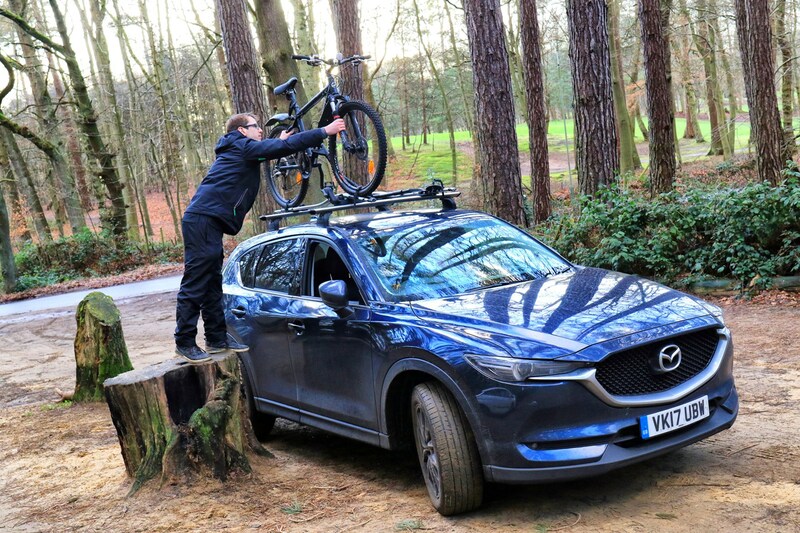 As a result of the inconvenience of this bike rack, and the greater wind noise and fuel consumption, we'd be keen to find ways of fitting bikes inside the CX-5 and loading other luggage on the roof, if need be. 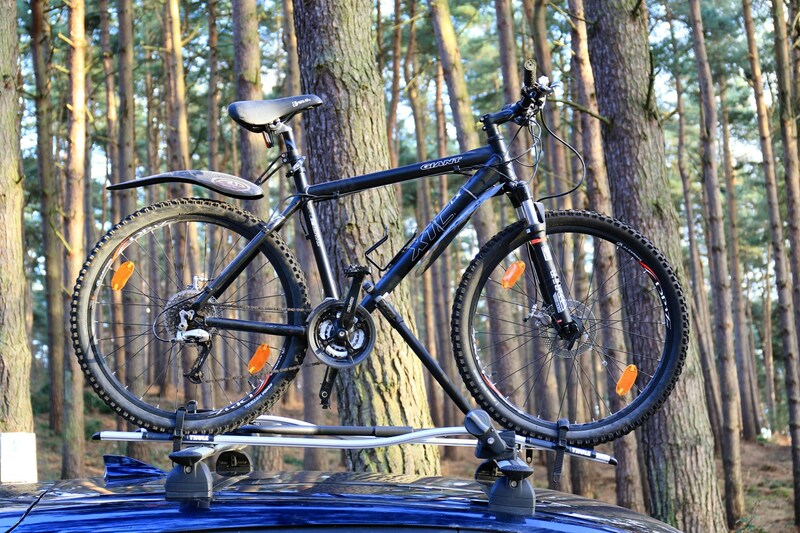 Another way of transport bikes around is by using a bike rack mounted on the car’s towbar. 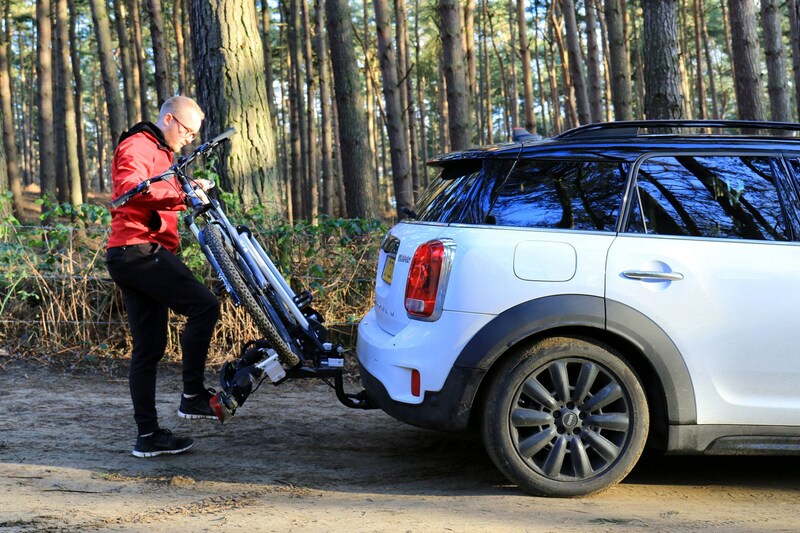 First, and unsurprisingly, your car needs to be specified with a towbar for this to work, and you need more space to store the rack when it’s not in use. 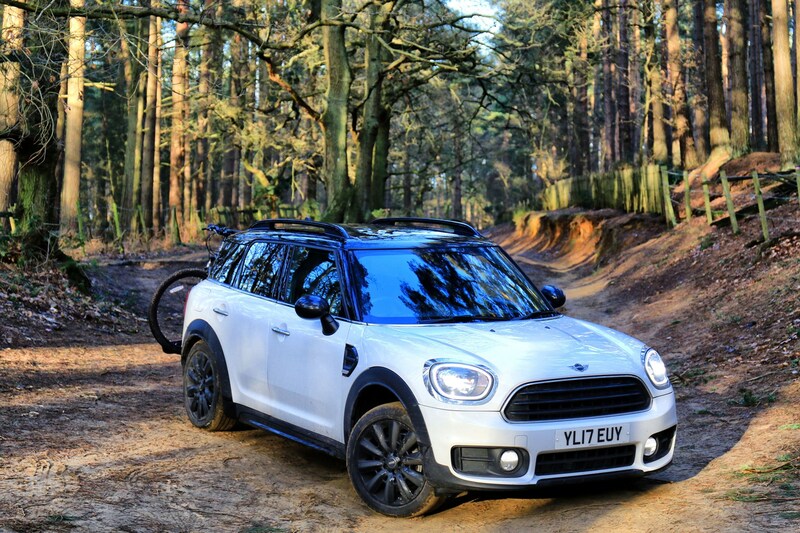 That’s not quite the case for the MINI Countryman, though. 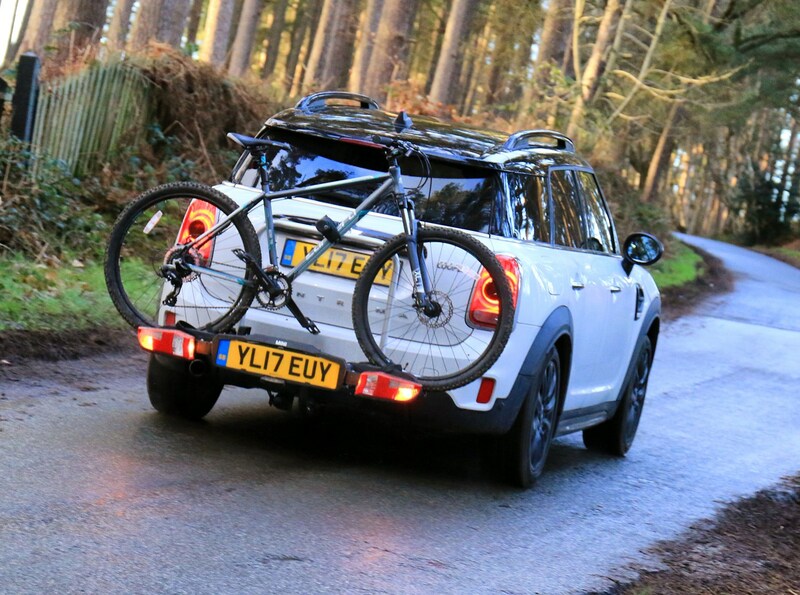 As we discovered in Update 7 of our long-term test, the MINI’s bike rack is a very clever piece of kit. 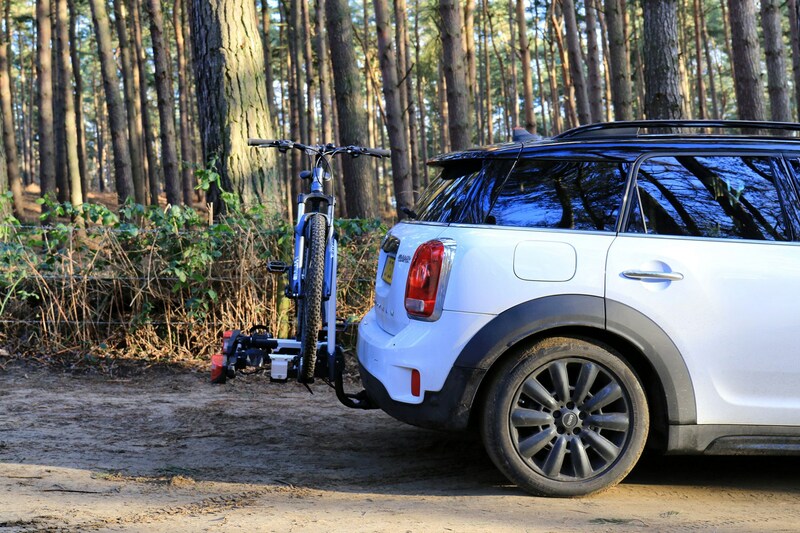 When it’s not in use, all of the fittings – including the towbar – fit beneath the boot floor so it’s always available. Installing it is easy, as everything sits on the towbar and fixes in with reassuring thumps and clicks with a properly solid feel. 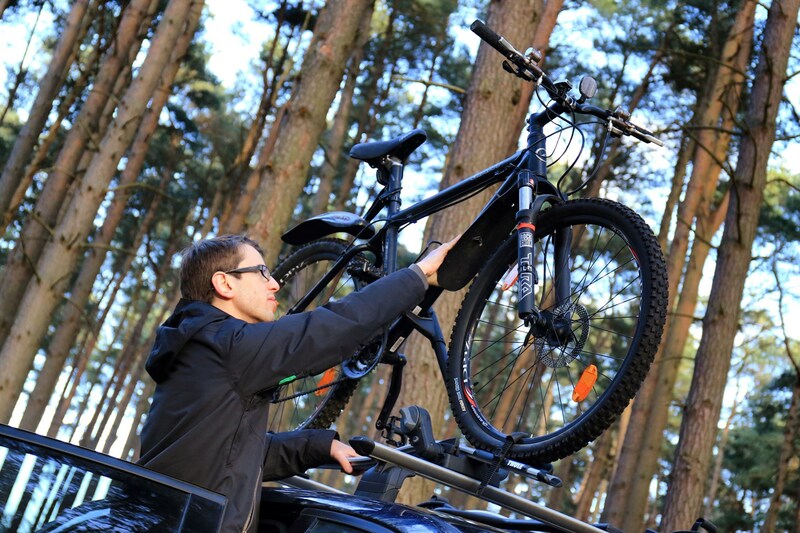 Loading the bikes is much easier than with the roof-mounted systems, too. One person won’t struggle as the height is much more manageable at the back of the car, with no precarious reaching necessary. Similarly, it’s a doddle to unload the bike again after. If you forget something’s in the boot, there’s a small pedal to tilt the whole rack away from the car, allowing access to the boot. The main issue with this type of bike rack becomes apparent when you’re in a car park. 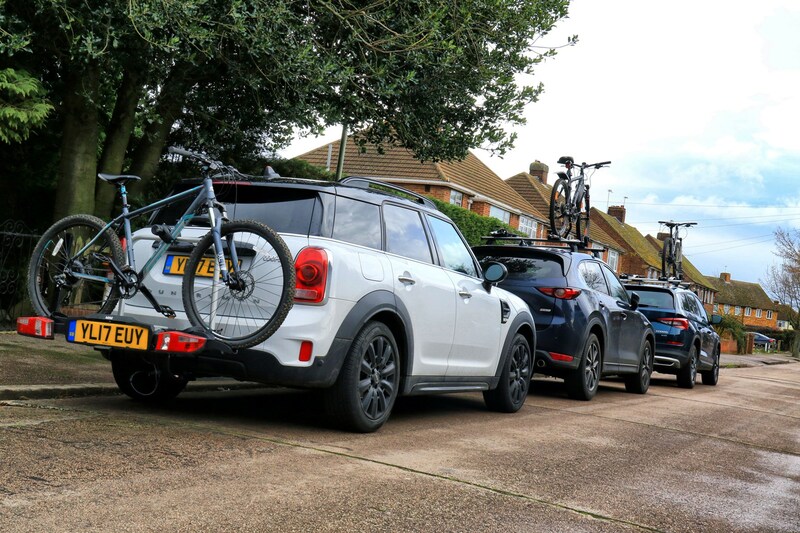 Due to the extra length, you either have to choose between leaving the front of your car hanging out into the road or leaving your precious bikes sitting in the firing line. Also, it makes manoeuvring a little trickier as the parking sensors are disengaged when the electrics are hooked up, meaning it’s hard to tell where the back of the car is. At the same time though, it’s clever that the sensors aren’t in use as they’d be bonging constantly in reverse. Again, in plugging in the connector, you’re unable to open the electric tailgate with the key to prevent any embarrassing knocks. 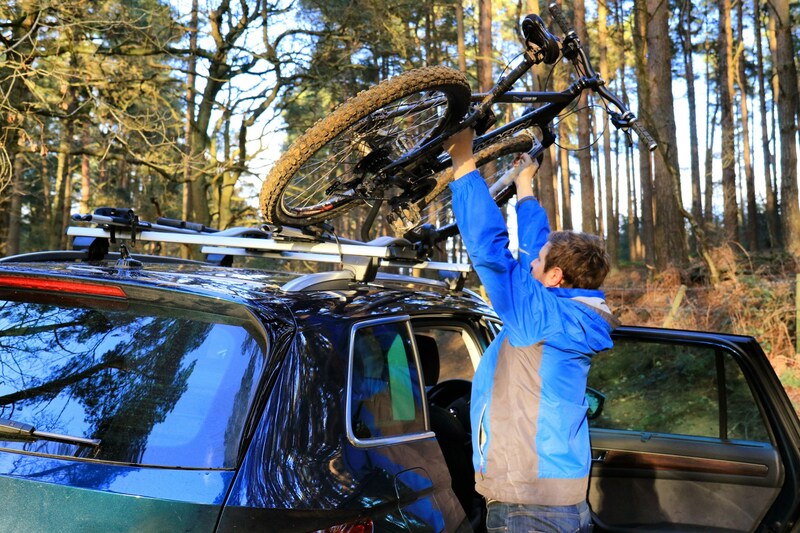 You can only open it from the bootlid once the rack has been tilted out of the way. Clever stuff. That clever stuff comes at a price, though. 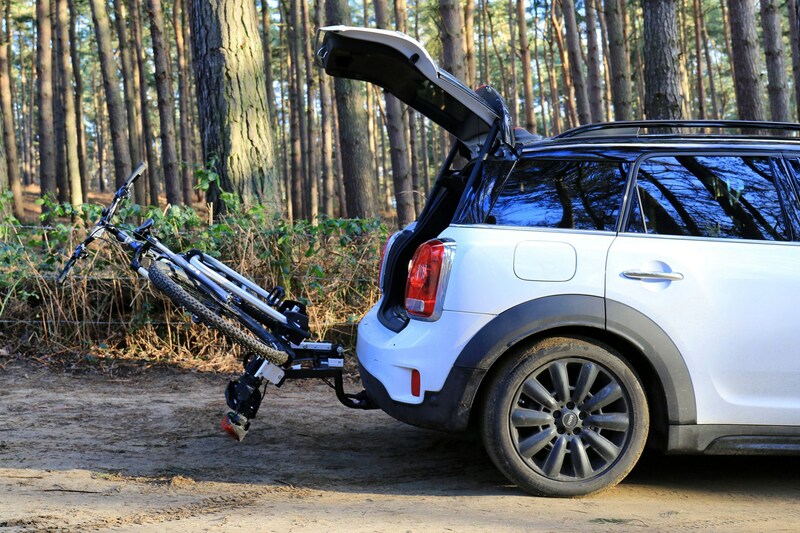 At just shy of £500 (plus any costs a MINI dealer will incur for fitting it), the MINI’s system isn’t cheap. It’s the price you pay for convenience, at least compared with the other two. We’ve deliberately not included a tailgate-mounted bike rack here, largely because manufacturers don’t sell their own versions of these, and also because they’re the least convenient. They are, however, the cheapest. You can easily pick one up for under £100, but fitting them can be tricky, and it’s possible that you might do some damage to the car’s paintwork if it isn’t fitted properly. Issues are also presented if you need something out of the boot, with the need to remove the whole lot just to get the tailgate open on many of them. 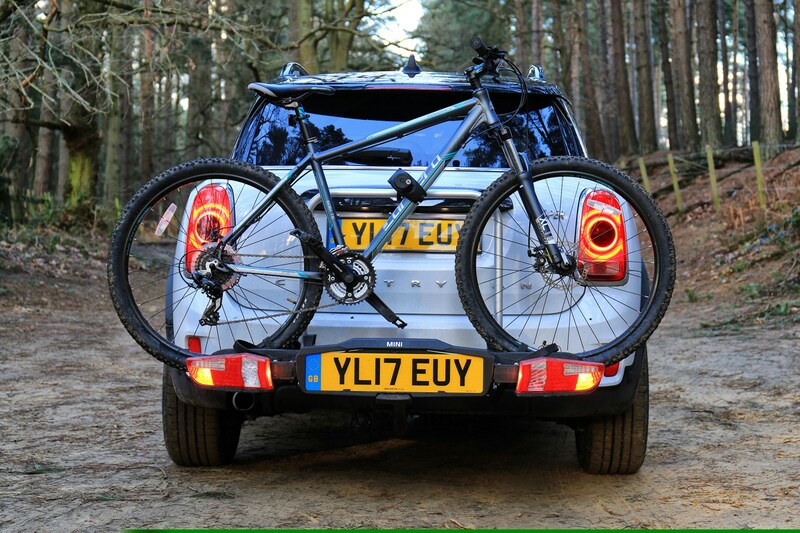 If the budget allows, a bike rack like the one MINI offers is an excellent one. 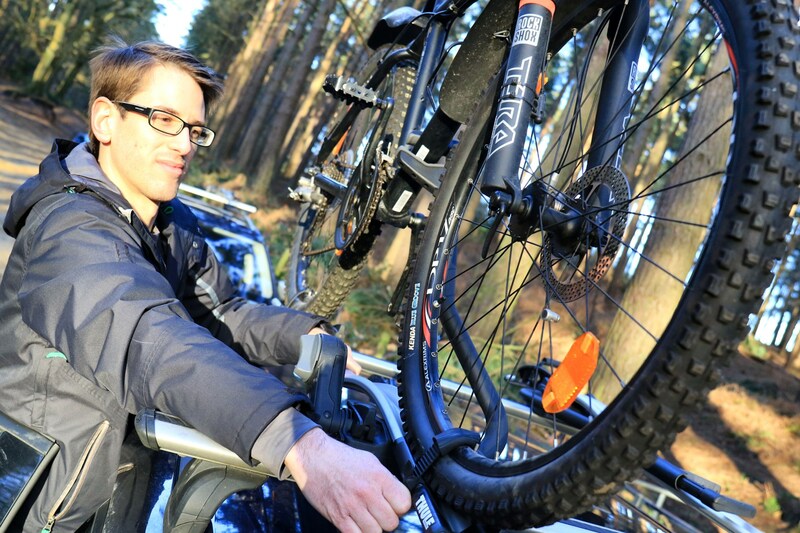 It’s ergonomically excellent and very easy to fit, and you don’t need a second pair of hands to load the bikes on, either. It’s not the most practical for car parks, but the ease with which it packs away into the car is brilliant. The roof-mounted ones either have to stay on all the time or you need to find somewhere to store the rails and racks. 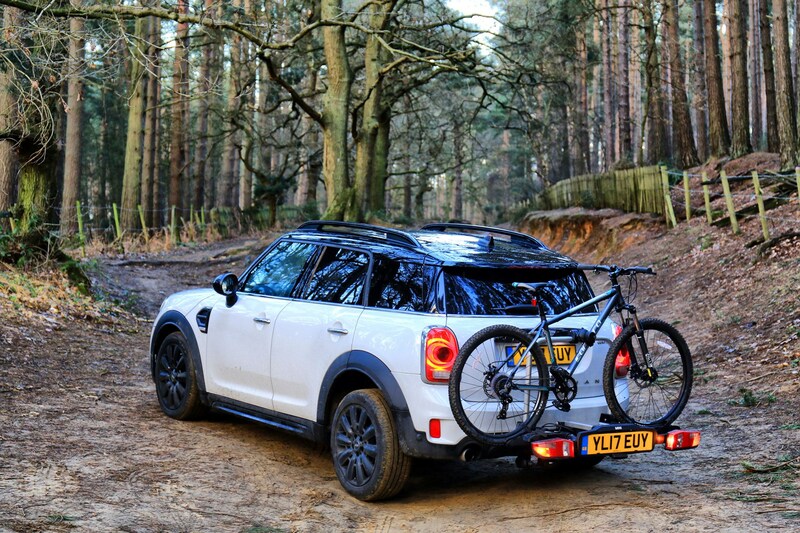 They don’t take up quite as much space as a towbar-mounted system that doesn’t fold back into the car (the MINI is unique in offering this), but if ease of use is your priority, we’d recommend spending the extra and going for a towbar-mounted one. Plus, you don’t have to contend with any height restrictions or extra wind noise.